You'll be £14.99 closer to your next £10.00 credit when you purchase Chiang Kai-shek versus Mao Tse-tung: The Battle for China 1946–1949. What's this? 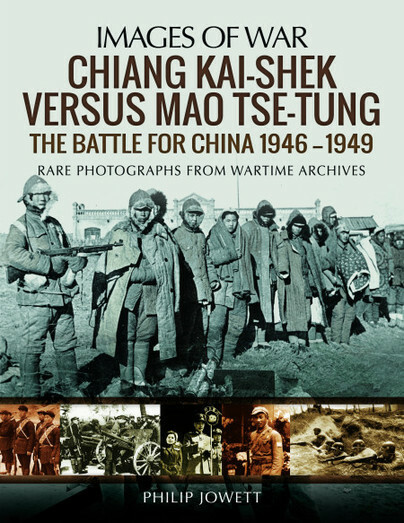 This volume in the Images of War series is the first photographic history of the Chinese Civil War, fought between Chiang Kai-sheks Nationalists and the Communists of Mao Tse-tung, which decided the future of modern China. A selection of over 200 archive photographs, many of which have not been published before, depict the battle for power that took place across the breadth of the country. The armies, air forces and navies of the opposing sides are shown in a sequence of graphic images, as is the ordeal of the long-suffering Chinese civilians who were caught up in a conflict that cost millions of lives. A detailed accompanying text by Philip Jowett describes the make-up of the Nationalist and Communist forces, their contrasting strategies, tactics and leadership. The contemporary photographs give an insight, as only photographs can, into the conditions faced by the soldiers and their experience of the struggle. His work provides a concise introduction to a pivotal conflict that has left an indelible mark on the China of today. It will be fascinating and informative reading for anyone who is keen to understand Chinas recent past and the military history of the twentieth century. Philip Jowett has been writing military history since 1997. He has published many books on the armies of Asia in the first half of the twentieth century, and has made a special study of the armies of China. He has also published on the Russo-Japanese War, the Mexican revolution and the Italian and Japanese armies of the Second World War.